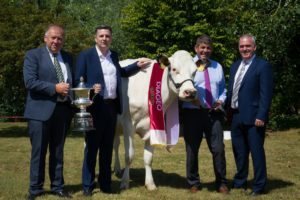 [11th July 2018]: The 35th Diageo Baileys Champion Dairy Cow Competition was launched recently by Minister of State for Food, Forestry and Horticulture, Andrew Doyle T.D. at the Baileys production site in North-West Dublin. The competition finale takes place on 22nd August at the Virginia Show in Co. Cavan and carries a prize fund of over 10,000 Euros. Cash prizes are available across several categories including Junior Cows in their second lactation. Entries are now open from Northern Ireland and the Republic of Ireland. Last year’s winner was Sam McCormick from Co. Down. About Diageo: Diageo is a global leader in beverage alcohol with an outstanding collection of brands across spirits, beer and wine categories. These brands include Johnnie Walker, Crown Royal, JεB, Buchanan’s and Windsor whiskies, Smirnoff, Cîroc and Ketel One vodkas, Captain Morgan, Baileys, Don Julio, Tanqueray and Guinness. Diageo is a global company, and our products are sold in more than 180 countries around the world. The company is listed on both the London Stock Exchange (DGE) and the New York Stock Exchange (DEO). For more information about Diageo, our people, our brands, and performance, visit us at www.diageo.com. Visit Diageo’s global responsible drinking resource, www.DRINKiQ.com, for information, initiatives, and ways to share best practice. Celebrating life, every day, everywhere. About Glanbia Ireland:Glanbia Ireland is a world class, ambitious, integrated agri-food business, with a diverse portfolio of quality ingredients, leading consumer and agri brands with the proven talent to succeed in the global market. Glanbia Ireland owns leading consumer and agri brands such as Avonmore, Kilmeaden Cheese, Premier Milk, Wexford, mymilkman.ie and GAIN Animal Nutrition. It processes a 2.4 billion litre milk pool from 21 counties and exports high quality dairy and agri ingredients as well as branded products to over 60 countries. Since 1974, it has been the exclusive supplier of cream to Diageo, a key ingredient in the production of the world famous Baileys Irish Cream Liqueur.